You know, I never noticed before. But most of the puppet shows I've seen, whether in a theatre or on a screen, have been incredibly dialogue-heavy. I mean, I've always known that puppets don't need to speak. Indeed, that's something I demonstrate in my workshops by manipulating a teddy bear to show various emotions: he can communicate happiness, sadness, and fear purely through gesture. But it wasn't until I attended Animotion that I realized just how much talking goes on in most puppet shows. The puppets are constantly talking about how they feel, talking about what they've done, talking about what they're going to do, cracking jokes. Yak, yak, yak. Even my beloved Fraggle Rock is guilty of this. Not that it's necessarily a bad thing. But now that I notice it, I can't un-notice it. It probably happens because these shows start with a script. All the dialogue is written before anyone actually picks up a puppet. Conversely, Jim Morrow taught us to develop a play with gesture alone, and then layer text on top of it. Most of the bits we created at Animotion had no talking at all. Those that did only used dialogue to convey things you couldn't with gesture ("Honey, will you water the flowers? "; "Is she there? Put her on!"). Sometimes they'd have dialogue at first, but with further rehearsal the words would drop out as we realized we didn't need them. Aaron Diaz, creator of the webcomic Dresden Codak, did a blog post about how he puts a comic page together, and he said something really interesting. He knows what has to be conveyed in a scene, but he doesn't write the actual dialogue until the images are almost done. The text doesn't lead the image, it augments it. Like comics, puppetry is a visual medium. I'm not saying puppets should never speak -- indeed, it's quite possible that you couldn't sustain a half-hour show with gesture alone. (Then again, ballet does it!) But so many puppet web shows consist of puppets talking to the camera, and I can't help but wonder if there are other ways to do it. I'm back from Mermaid Theatre of Nova Scotia's three-week intensive puppetry class, Animotion. And what an amazing experience it was! To begin with, this is the sight that greets you when you walk in the door. 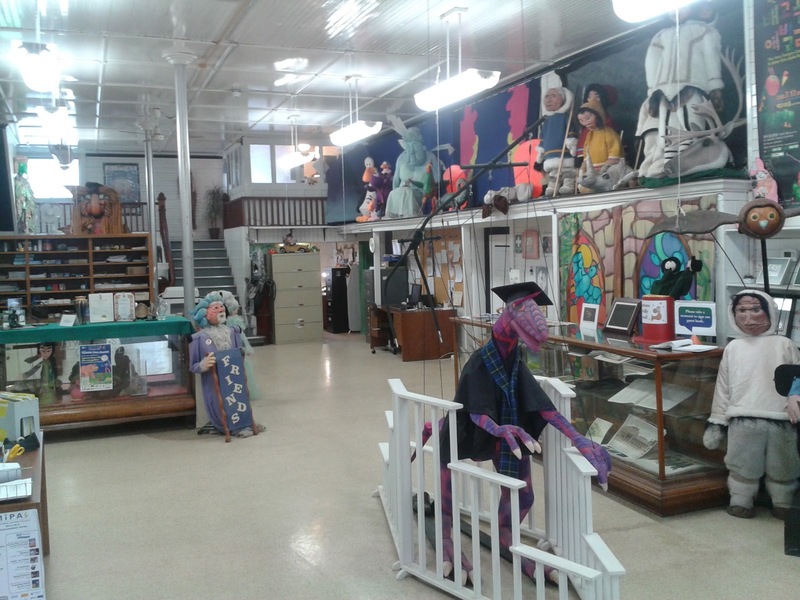 The building is filled with puppets from past shows, from Just So Stories to Goodnight Opus. So right from the start, it was incredibly exciting and inspiring just to be there. It also came in useful: whenever we got stuck creatively while building our puppets, we were encouraged to wander around and be inspired. 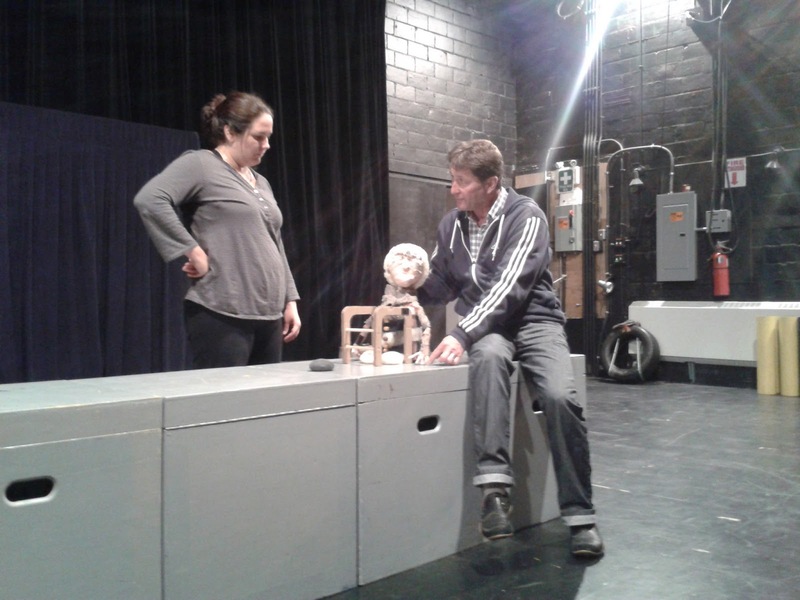 The class itself was taught by Jim Morrow, Mermaid's Artistic Director, and Struan Robertson, a Production Associate who does a lot of their puppet building. It was held on the stage of the 400-seat theatre that's part of the Mermaid complex, which also includes several workshops and rehearsal spaces. There were five students in the class, which was a perfect size. Big Dough Boy in action. Photo by Struan Robertson. Every day began with exercises like juggling and sandbag balancing, and drama games like keeping a ball in the air. Over the three weeks, we worked with various different types of puppets: hand puppets, little Dough Boys that took three people to operate, big Dough Boys that took five people to operate, found objects, tabletop puppets, and live-handed floor puppets. We also worked with puppets that we'd made during the evenings of the first week, and got the benefit of Jim and Struan's insight into how to make them work better. Through it all, we learned to divide motion into beats to give our puppets thought; to move our bodies along with our puppets instead of planting our feet; to keep our own movements elegant and efficient to avoid stealing focus from the puppets; and so much more. Jim helps Ryanne put her old lady puppet through its paces. Two of the biggest lessons I learned weren't officially part of the curriculum. The first was that puppet building is supposed to be fun. This sounds obvious, but the truth is that when I'm building puppets, I tend to get very tense and irritable. When we were building our puppets at Mermaid, we were chatting, listening to music, and sometimes having a drink -- it was a relaxed atmosphere. This is something I'm going to try to keep up now that I'm back. The second lesson was that I am capable of generating material. 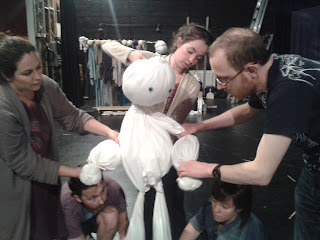 Once we'd gotten the hang of performing a certain puppet, we were handed a prop -- a lemon, a watering can, a telephone -- and told to create a routine or a story with it. And every time, we did it! I had no idea I could do that. And I certainly never would have thought of using a prop as a catalyst. I'd always tried to start with dialogue, which never worked. 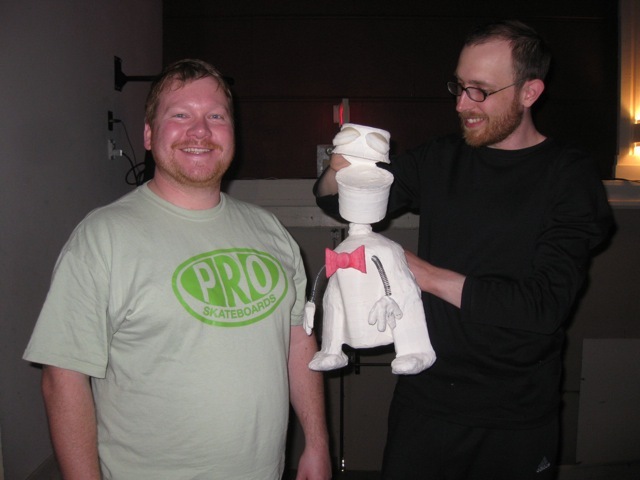 Struan and me with the puppet I built. Photo by Wendy Elliott. I would recommend Animotion to anyone who is serious about puppetry. I presented a workshop at Westfest yesterday and can already tell that Animotion has made me a better puppeteer. On top of that, it was made clear to all of us that we now have a relationship with Mermaid Theatre -- this class was only the beginning. I also got a lot of insight and new directions for my full-body puppet, Atlatl. Watch this blog in the weeks to come! The Animotion 2013 gang: Jen, Jim, Ryanne, Simon, Struan, Alanna, and me. Photo by Margo Gesser.